Cartridge choice is one of the most frequently discussed topics in shooting. 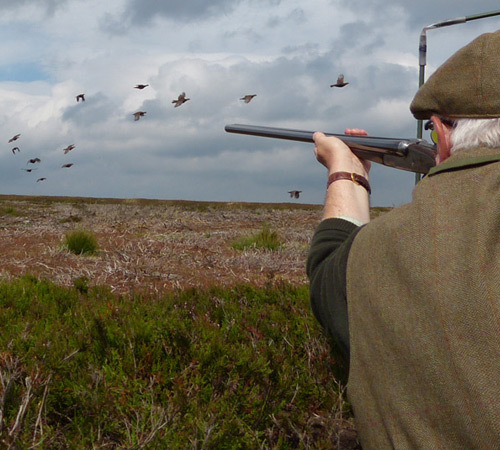 There are no hard and fast rules, but the following are our suggestions based on 40 years’ experience of letting Game shooting throughout the UK. Before going any further, our first point to stress is that all cartridges used for game shooting should have a Fibre wad. This is for environmental/wildlife/farm stock reasons. We recognise that plastic wads are more efficient than fibre, but they are unsightly left scattered across the countryside and more importantly can be the cause of injuries to livestock who will ingest them. Only Fibre wads should be shot at game in the UK and almost all shoots now insist on this. In August and September we believe nothing larger than 30 grams of No.6 shot is necessary to cleanly kill a grouse at up to 40/45 yards. Our own 29 gram 6 ½ shot (Red Grouse cartridge) was specifically designed for this type of shooting which produces an excellent pattern and is a good balance of shot size and ‘punch’. Later on in the Grouse season there is an argument for using a heavier load with perhaps No. 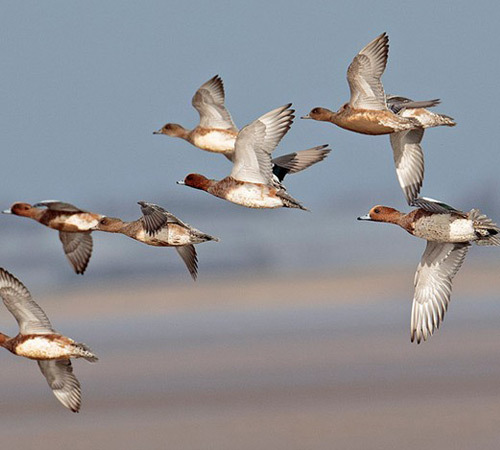 5 shot as the birds get stronger and faster and are harder to kill, particularly going away. Serious consideration must however be given to the distance that the larger shot will travel from these heavier cartridges, in relation to shoot staff specifically flankers during a grouse drive. Certainly nothing bigger than 32 grams of 5 shot should be used on a moor and we recommend something a little lighter such as the Blue Lightening 31 gram 5 ½ shot cartridge. Early season (September/October) partridges need little more than 28 grams or possibly 30 grams of No. 6 shot. The only exception being those high bird partridges found in hilly areas which usually benefit from going up one shot size to a No. 5. As the season’s progresses and Pheasants appear as the main quarry species, then No. 5 shot is the preferred shot size either in 30 gram or later into January with up to 32grams. The Blue Lightening 31 gram 5 ½ shot is an excellent cartridge for this stage of the season. 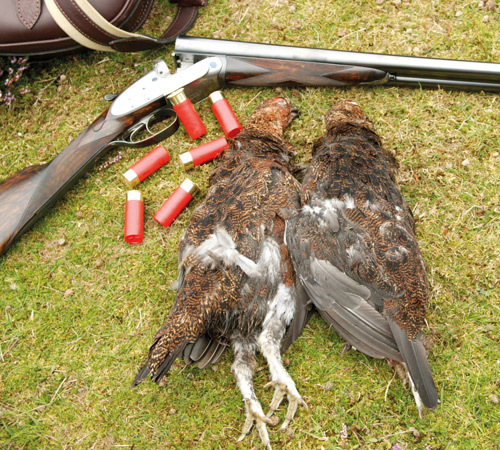 On Higher bird shoots, typically found in the West Country, Wales, North Yorkshire, the Scottish Borders and elsewhere, 32 grams either in 5 shot or even 4 shot is recommended. For most English game guns, 30 gram of No. 4 shot is a good compromise of weight of cartridge in a lighter gun for these sorts of extreme range bird, as few side by sides will handle any heavier loads. 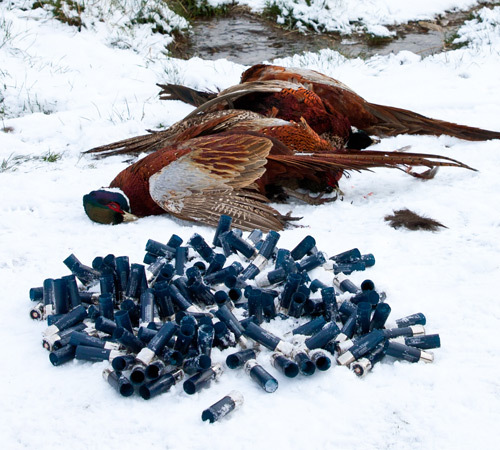 For even the highest birds right on the limit of a shotgun’s range, we would not recommend going beyond 34 grams of 4 shot – not least because it is very hard to find a cartridge larger than this without plastic wads. In addition, such cartridges tend to be far less forgiving for the user in terms of “kick”, particularly with any volume of shooting. We are seeing more and more 20 gauge shotguns being used in the field these days as well as 16 and 28 gauge and perhaps more surprisingly, .410’s. The choice of cartridge for these calibres is far less than for a 12 bore, but we would suggest that 25 grams of 6 shot for early season and 28 grams of 6 shot or more often 5 shot, should cover most eventualities for the 20 gauge user. For 16 gauge, either 26.5 gram of 6 shot earlier on and then 28 gram of 5 shot should again be the most popular choices in a fibre wad. The 16 gauge is intrinsically a lighter gun than the 12 bore and side by sides particularly, do not seem to respond well to heavier loads. 28 gauge users seem to suffer from arguably the finest cartridge in this calibre being made in the US (Federal and Winchesters) and so being prohibitively expensive and only available with a plastic wad. However, Gamebore in particular make a very good range in their Pure Gold series with a fibre wad from 16 grams of 6 shot for the younger shooter through to 25 grams of 5 shot which we recommend for higher birds. The debate over steel versus Bismuth (tungsten matrix now being extremely expensive) rages, but assuming you have a gun which could use either (steel is not recommended for older English guns or for barrels with fixed choke tighter than ½ [0.02 inches of constriction] we always recommend at least one shot size if not two shot sizes larger than the equivalent lead cartridges, as well as a heavier load. For instance, where we used to use 30 gram of 6 shot for duck with lead shot, 32 grams of 4 shot of steel or Bismuth should be considered. Ducks (and geese) have much denser, downy feathers for the shot to penetrate and they require much greater hitting power found in the kinetic energy of the larger shot. For the record we would never use anything less than No. 2 shot for wild geese or American BB’s when flighting them on the foreshore.